When I got to ‘Sarah Island‘ I was an instant, dribbling mess. The song is so beautifully, evocatively emotive, encompassing the content of the awful reality of the original penal colony, but also the referent extrapolations to related themes of being trapped, separated, and contemplating sweet release over persevering with pain and suffering. The final verse rarely leaves me with a dry eye. I listened to the song a hundred times, learnt the lyrics, sang it a capella in dozens of singing sessions, and it crept in and around and surrounded my subconsciousness. One day, I parked my car under the Hyperdome in Canberra and went in to retrieve my copy of ‘The Next Turn’ which I’d loaned to Frog from Songland Records for a listen. I was on my way to Numeralla Folk Festival and once more, the synapses were off in different directions. Around about Michelago I remembered that at some point I’d been in the carpark next to the car, doing my usual trick of holding 36 things at once, wishing mum had mated with an octopus not dad, and that at some point I’d rested the album on my car’s roof. Greenway to Michelago is a long way, and I’d like to think that someone in the Hyperdome carpark, or maybe around Bonython or Theodore is to this day enjoying their complimentary copy of ‘The Next Turn’, complete with Joe, Benno, Ado and Kate-o’s signatures. I re-purchased my personal copy that September at The Turning Wave. But at some point since, my life has become even more transient and itinerant than it was then and storage of most of my goods, chattels and personal effects has become a thing of necessity. My vinyl collection is all gone, my CDs have been pared down to the absolutely definitely must keeps, and ‘The Next Turn’ is in that large plastic vault, currently holed up in my one-metre-cubed existence in Kingsgrove, NSW while I have found the truth in my card from the federal government that says ‘No Fixed Address’. For now, I’m a Queenslander, but who knows which way the winds will blow in early June? And so we come to this festival which the Google gods did not rightly treat me well with. Or was it Google or some other force? The search term ‘Woodford Folk Festival Trouble In The Kitchen’ is now turning up the right results, so maybe the problem with the search engine was between the chair and the keyboard. Either way, at about 10.55am today (New Year’s Eve, Queenslandia time), I was scooting down the path towards the Concert Stage, pausing only briefly to talk with Nick from Library Media to take a cheesy photo and get all mutually appreciative and excited about caring, sharing business practices involving contra and barter instead of tax invoices, and I slid sideways into the front row just as Trouble In The Kitchen were introduced on stage. One or two tune sets into their gig, this happened. And I was battling to keep the camera on an even keel. In the final verse and chorus, you can observe ripples in the video where I was starting to lose it. 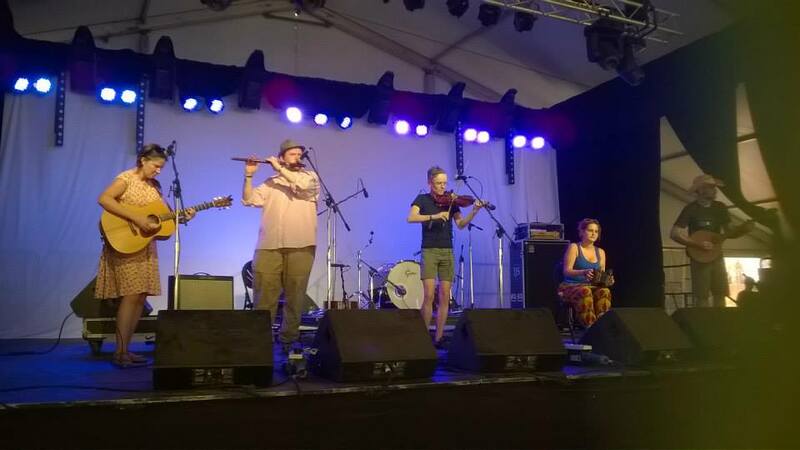 Trouble In The Kitchen will be performing at Port Fairy Folk Festival, and you can keep up to date with their other appearances at their website. We all need a little flushing out on a regular or semi-regular basis. You get that. Like I said, Youtube comes with a stabilising feature.